Customers began to approach hosting provider SysEleven about running containers and using container orchestration. To offer their customers the highest quality services for which they are known, they sought an easy to use container orchestra- tion solution. SysEleven chose to partner with Loodse to create MetaKube, a white label of Loodse’s Kubermatic Container Engine, giving their customers Kubernetes clusters in one click. 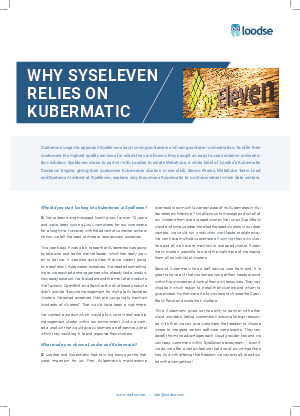 Simon Pearce, MetaKube Team Lead and Systems Architect at SysEleven, explains why they chose Kubermatic to run Kubernetes in their data centers.